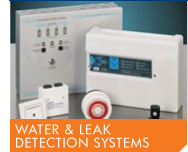 There are many systems available to detect the ingress or rising level of water and other fluids such as oil in all sorts of areas such as plant rooms, computer rooms, and basements using systems specifically designed for the purpose. As well as being able to monitor and alert you of a potential problem we are also able to interface to other products such as shut off valves or drain pumps to ensure levels do not go above what is acceptable. We utilise a number of different manufactures products to achieve this such as Vimpex Hydrosense - which offers the flexibility of two methods of detection - probes and Hydrowire and can be connected to the Fire-Cryer audible message system, Aqualeak – Oilbug (with Redeye probes) Aquatech, waterbug, & AquaTrac and Tracetech. 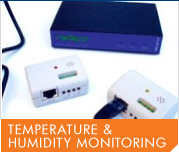 Some processes and storage facilities are extremely sensitive to temperature and humidity changes and this can include Fridges, freezers, computer rooms, data centres and comms rooms. With the correct equipment these areas can be monitored to show minute by minute fluctuations and create a warning should the environment go outside set parameters. 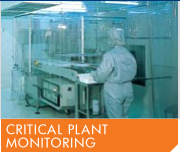 Many commercial plant systems incorporate some form of monitoring to indicate failure or warnings of an impending problem. Many larger sites have all this monitoring incorporated into a Building Management System ( BMS ) but where this is not the case we can connect and monitor these systems for you. 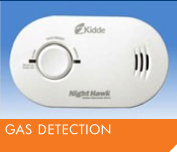 Gas, CO2 and Carbon Monoxide Detectors are the most common of gas detection devices used and they range from simple battery operated units to more complex and highly sensitive devices. Whether it be for the home or business we supply, install and monitor these devices to ensure personal safety and the safety of your premises.